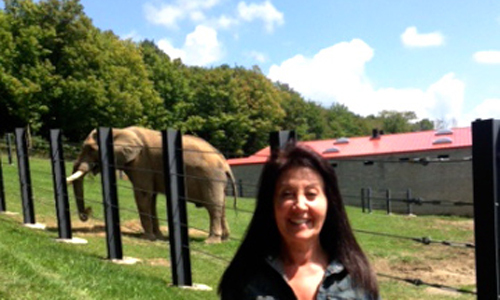 Janet Rose with Jackson the elephant at the International Conservation Center. At this time of year, as thoughts turn to giving, generosity and the world around us, many of us who work in the field of wildlife conservation, also turn our thoughts to the plight of wild creatures – the threatened, the endangered, the vanishing species. But never doubt the power and impact of wildlife film on this sometimes sorrowful landscape. After leaving IWFF a year ago to return to active conservation and a senior role in development, one of the elements of major fundraising that I took with me, was film. The impact of media cannot be overstated. While still often under-utilized in the conservation realm, it remains one of the most influential tools we have. 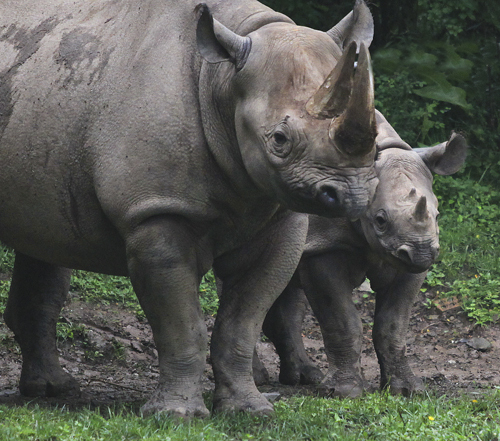 Pittsburgh Zoo’s Azizi and her black rhino calf Janine. She was the first black rhino born at the Zoo in 47 years. This past summer, the Pittsburgh Zoo & PPG Aquarium and the Zoo’s International Conservation Center, hosted the International Elephant & Rhino Conservation & Research Symposium. The Symposium brought hundreds of elephant and rhino experts from around the world to Pittsburgh to tackle the most significant wildlife issues facing us today. As with many conservation organizations, including zoos, the use of wildlife film is infrequent. But when the President of the Zoo, one of the zoo-world’s leading wildlife experts, opened the door to incorporating film into the symposium, I jumped at the chance to blend past experience with the present. 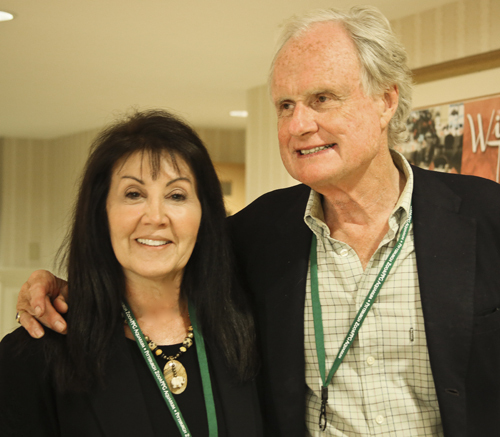 Janet and John Heminway, who made the film Battle for the Elephants. Battle for the Elephants, a National Geographic award-winner at multiple film festivals was screened and film producer John Heminway, joined the Symposium as a featured speaker and guest. His focus was the investigative work of his team in the battle to save the African elephant from the slaughter for ivory. As the discussion with John wore on into the night and trickled into the wee hours at the nearby watering hole, it was clear that the film had made an impact like few other things can. I think it was the visuals, the interviews and the emotions they stirred that riveted otherwise stoic animal experts into a higher level of issue engagement. Later in the week of the Symposium, National Geographic’s Jared Lipworth and former producer David Hamlin joined a Gorongosa representative to talk about War Elephants, a Bob Poole film about the elephant restoration efforts in Goronogosa National Park in Mozambique. The mixed audience of elephant and rhino experts, scientists, curators, zoo staff, and lay public was a testament to the impact and influence of wildlife film. Despite the avalanche of information produced today by the media, the Internet and social media, there is still nothing like the impact of film and television. Both Battle for the Elephants and War Elephants captured the minds and hearts of audiences in their own unique way. You can listen to speakers, you can read great articles and you can become educated and aware, but when you see wildlife in all its magnificence, its terror and its sorrow, on screen, its influence is deep and unwavering. As I left IWFF for a new opportunity to work in wildlife conservation, I did not leave wildlife film or the influence of the wildlife film festival, far behind. Several weeks ago, we produced a film about the Pittsburgh Zoo’s International Conservation Center, a 700+ acre rural farm where elephants roam and where one day soon, an elephant breeding program will be underway. It’s also home to three elephants, rescued from Botswana when they were slated for death. It was only a short film, 7 minutes in length with donated footage from cinematographer Bob Poole of the elephants he filmed in Gorongosa. As the lights came on, we noticed tears in people’s eyes. By the end of the day, over $100,000 had been raised for elephant conservation. I like to think that small video had a big impact. The power of wildlife media is alive and well. With so many applications, uses and ways to reach people, if you are in the business of making wildlife film, never doubt its impact, its potential and the possibilities of what you create. It is truly a gift for conservation that keeps on giving. Since the late 1990s Wildlife-film.com has been the leading source of information for the wildlife filmmaking industry worldwide. For over fourteen years the site has been Google's number one ranking site for 'wildlife film' and related searches. Our site is viewed in over 175 countries. Our newsletter, Wildlife Film News, is read every month by thousands of people involved in wildlife filmmaking - from broadcasters and producers, to cameramen - we encourage readers to submit their news. We also serve as an online resource for industry professionals and services. Find producers, editors, presenters and more in our Freelancer section, and find out about festivals, training and conservation in Organisations. We encourage amateur and professional freelancers to join our network and welcome all wildlife-film related organisations to join our team.